Ford’s ahead of the game with their turbocharged engine offerings and their aluminum bodies. But as we already know, the Blue Oval is putting a cherry on top by adding four more gears to their transmission and they’re increasing their 3.5-liter EcoBoost’s torque output to insane levels. Today we learned a bit more info on that new powertrain; here’s what we know. Ford held a little event at their headquarters in Dearborn where they showed journalists the new 10-speed automatic and 3.5-liter EcoBoost engine—the powertrain slated to debut in the 2017 Ford F-150 this fall. Here are some details I gleaned from the event. Ford walked us through the improvements of the second generation 3.5-liter EcoBoost V6, but before we get into the metal bits, let’s get straight to to the good stuff: the power figure remains unchanged at 365 horsepower, but the engine’s torque number—which was already higher than that of the available V8—adds another 30 lb-ft to last year’s for a total of 450 lb-ft of rotational influence. That’s a ton of torque from a little 3.5-liter gas engine, and the motor now handily outdoes even the Ram’s 3.0-liter EcoDiesel. 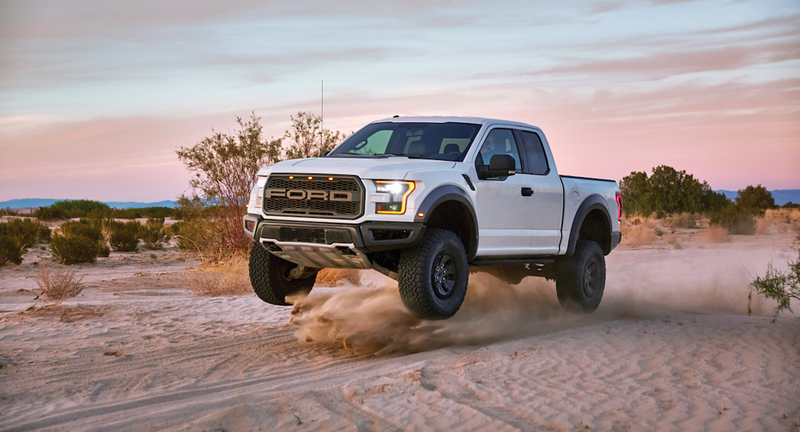 It’s worth noting that the Raptor will be offered in a higher output version of the 3.5-liter V6. Will it get the 450 horsepower and 440 lb-ft that Forza 6 claims? I’m not sure about the horsepower figure, but considering the base 3.5-liter makes 450 lb-ft, I can’t imagine the Raptor will only make 440. We’ll see when Ford releases Raptor power and torque figures later this year. The new second generation 3.5-liter EcoBoost gets a dual-direct and port fuel-injection system, meaning there’s an injector in the cylinder and one just on the other side of the intake valve in the intake port. Ford says this allows for better power, efficiency, emissions and cold-start capability. There’s also a new set of turbos with a lighter supper alloy turbine wheel whose lower rotational inertia should improve transient response time, Ford says. Working with those new turbos are electronically activated wastegates, which can open up anytime, whereas the outgoing 3.5-liter EcoBoost had to build boost before diverting those exhaust gases. All of these turbo enhancements offer better engine and turbo efficiency, ultimately resulting in more torque and a flatter torque curve. The new engine also offers a variable displacement oil pump (which is likely used to optimize oil flow to reduce churning losses), tougher valves, a new hydraulic valve-lash adjuster, improved accessory drive efficiency, new pistons are also new, fresh hollow camshafts, and lots more. Ford says the lighter camshafts, along with the new roller finger follower valve train provide four pounds of weight saving, and that overall, the engine weighs a couple pounds less than the old mill. Ford also showed us their new supposed “industry first” 10-speed automatic transmission that is supposed to offer better acceleration performance and better fuel economy. The new trans has a few neat tricks up its sleeves besides the obvious four extra gears. It’s got a variable displacement pump and low viscosity fluid for lower churning losses, a built in electric pump to maintain oil pressure when the engine is off for more seamless Auto Start-Stop operation, and it promises lower clutch drag compared to the outgoing six-speed. The transmission, which is built by Ford, offers extremely wide gear spacing. First gear is a 4.7:1, versus the current six-speed’s 4.2:1, and there are now three overdrive gears instead of two. Ford is taking advantage of all that transmission gearing to numerically lower their axle ratios for better highway fuel economy, though towing numbers stay unchanged. Ford also bragged about their new shift strategy, which apparently look at over a dozen engine and driver signals to choose the right gear. The cool thing is that, despite the four extra gears, the transmission is only about a half an inch longer, thanks in part to a torque converter turbine clutch that’s actually integrated into the torque converter. That integrated torque converter/turbine clutch also reduces about two pounds from the trans, though overall weight ends up being about 20 pounds more than the six-speed. Ford hasn’t released fuel economy numbers yet, but either way: more gears and more torque? That sounds good to us, and with over 60 percent of F-150 buyers opting for an EcoBoost V6, it’s safe to say lots consumers are happy about these improvements, too. Ford has dropped $145 million on the Cleveland Engine Plant and $1.4 billion into Michigan’s Livonia Transmission plant to prepare for the 2017 F-150, which is scheduled to hit the market this fall.